NautiBuoy Marine specialises in a modular system of inflatable platforms and docks, which can be enhanced with a range of accessories for both leisure and maintenance use. With each platform incorporating 4 x 40 litre Ballast bags on the underside, the jet-ski dock has eight ballast bags in total (all with quick dump system) making it incredibly stable. Plus, as it is in two sections it can rolled and stowed easily. The added versatility of the two platforms enables them to also be configured as an L-Shaped tender bay, end-to-end as a long runway or side-by-side as a large area for relaxation, the choice is yours. on their experience with the NautiBuoy platforms. 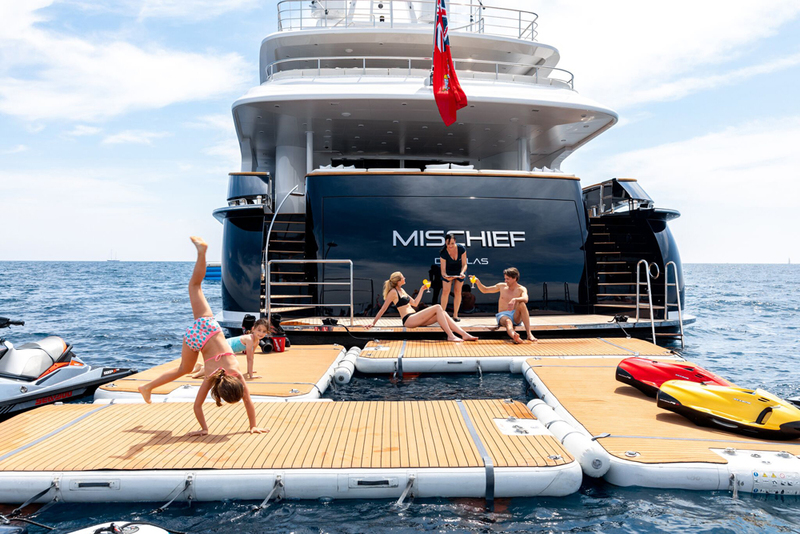 HOW HAVE THE NAUTIBUOY PLATFORMS CHANGED THE WAY YOUR CREW PROVIDE HOSPITALITY AT WATER LEVEL? “As a busy charter boat, we have always had a decent ‘stern set up’ with lots of toys and inflatables. We used to use a large jet- ski dock as part of this, but have found the NautiBuoys to be a better alternative to this. More stable and more versatile. We now find that people like to stand on, sit on and play on the platforms more than they used to with the jet-ski dock. The sun chairs have also made a big difference. It now forms the basis of every different stern set up that we do, and we plan to buy more to further improve this offering to our guests”. HAVE YOUR CREW COMMENTED ABOUT USING THE NAUTIBUOY MARINE PLATFORMS? They love them. Nice and sturdy, easy to deploy and recover and light weight compared with other inflatables that we have used. We certainly prefer their user friendliness and versatility compared with our jet-ski dock. Less storage room is needed, so this adds to their benefits. ARE THEY EASY TO INSTALL AND QUICK ENOUGH TO RETRIEVE WHEN YOU HAVE TO MOVE? Yes, the deckies say this is the best part of the NautiBuoy platforms. When we arrive at an anchorage, obviously the guests want to get in the water as soon as possible. And, obviously when we’re heading to a different location, the last thing a guests wants to hear is that we’re delayed because of packing up the toys and platforms. After we bought the NautiBuoy system, we’ve never had any delays either end! HOW HAVE THEY IMPROVED YOUR GUESTS AND OWNERS EXPERIENCE? They like to sit on the sunbeds and watch their kids play on the other inflatables and toys that we have out. Because they are tied directly on to the stern it is easy to serve them drinks there too. We have also used them as a platform for beach landings where we could not get the tender in to the shore due to swell. WHAT IS YOUR FAVOURITE THING ABOUT THE PLATFORMS? That they are light, easy to deploy and recover, easy to clean, dry and store and the fact that they make the swim platform larger. They effectively double the size of the swim platform and are a useful place to launch inflatables and towables from. They look much better than other inflatable we have used and are much more comfortable to walk on too. WHAT ARE SOME OF THE CHALLENGES THAT NAUTIBUOY PLATFORMS HAVE SOLVED FOR YOU? Beach landings without beaching tenders, which is great for guest safety. Another great benefit is when we need to wash down the hull. We place a special cover over the platform to protect it and away we go. WHAT ARE THE PLATFORMS BEST FEATURES? How sturdy, light, versatile and user friendly they are. To be honest the owner and guests love them just as much as the crew. But I think the best element is the beach deck extension that just gives us so many more options for laying out all the toys. HAS STOWAGE BEEN AN ISSUE? No. We have had a bilge modified specifically to fit them. They are large, but when rolled up they pack down nicely, and the crew have never moaned once!